It’s August, that means it’s back to school month! So I’m starting my sophomore year at Arizona State at the end of August (yay!) and I’m eager to use my new school supplies and as I earn money, buy some preppy supplies. Anyway, this is what I’ll be using for (at least) my fall semester. First on the list is my Lilly Pulitzer agenda! I went over most of the details about this agenda in my last post. Anyway, I’m going to use my agenda to keep track of my homework, school events, work and personal events. Simply brand 1″ binders $3.49 and Lilly printables from Jessica Marie Design Blog FREE! Next is standard 1″ binders form Staples ( using free (monogram editable) Lilly Pulitzer printables for the cover from Jessica Marie Design Blog (found here: Lilly Binder Covers). 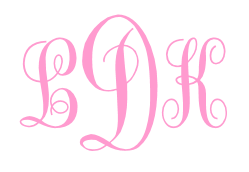 All you have to do is save the file (PDF reader required), edit the monogram to your initials, and then save it! (Note: She also has directions on her website). I love these because they are cute Lilly patterns and well, they’re free! Third, I’m using a tote that I got in a store off Lake Tahoe. I went to Tahoe on vacation and saw this tote and fell in love! Although there are no pockets, I’ll make it work and I’m excited to use it for school! Anyway, any kind of tote will work well or if you don’t want to use a tote you can always use a purse or a backpack! Fifth, I’m using Sharpie highlighters. I have never used these highlighters, I have used those big round Sharpie highlighters but I think these will be just as good. I use Sharpies all of the time and I love their products so I’m excited to use these highlighters. Plus I always love having a variety of colors to choose from. Lastly, I’m using Ticonderoga #2 pencils! I don’t really like to use pencils for taking notes or anything. I actually only get pencils for taking tests on scantrons. Regardless, pencils are always a good item to have in your school bag. Well that’s the most important stuff that I could think of. Let me know what you guys are getting for school! Have a great school year/semester!